This memorial website was created in memory of our loved one, Peter J. Jannetta, 84, born on April 5, 1932 and passed away on April 11, 2016. Where Peter J. Jannetta is buried? Locate the grave of Peter J. Jannetta. How Peter J. Jannetta died? How to find family and friends of Peter J. Jannetta? 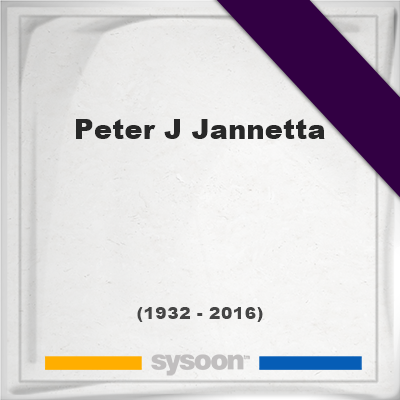 What can I do for Peter J. Jannetta? was an American neurosurgeon known for devising microvascular decompression, a surgical procedure to treat trigeminal neuralgia. At the University of Pittsburgh School of Medicine, he was the first Walter Dandy Professor of Neurological Surgery. Born in Philadelphia, Jannetta graduated from the University of Pennsylvania with an undergraduate degree and a medical degree. He stayed at Penn for training as a general surgeon, then completed a National Institutes of Health fellowship in neurophysiology before training as a neurosurgeon at the University of California, Los Angeles. During his residency at UCLA, Jannetta was in the laboratory dissecting a set of cranial nerves when he noticed that a blood vessel was unexpectedly pressing on one of the nerves. Jannetta suspected that this abnormal impingement of the nerve might be the cause of the painful facial condition known as trigeminal neuralgia. He devised the microvascular decompression procedure to treat patients with the condition. In addition to helping trigeminal neuralgia patients, the procedure became a treatment option for several related conditions. He was a faculty member and division chief at Louisiana State University before moving to a similar role with the University of Pittsburgh in 1971. In 1995, he spent a year as Secretary of Health for the Commonwealth of Pennsylvania. Jannetta practiced at Allegheny General Hospital for a few years before he retired. Jannetta received a Horatio Alger Award in 1990. The Karolinska Institute honored him with the Herbert Olivecrona Award in 1983. He was married twice, first to history professor Ann Bowman Jannetta, then to art critic Diana Rose Jannetta. He enjoyed playing the tenor banjo in his spare time. Note: Do you have a family photo of Peter J. Jannetta? Consider uploading your photo of Peter J. Jannetta so that your pictures are included in Peter J. Jannetta's genealogy, family trees & family history records. Sysoon enables anyone to create a free online tribute for a much loved relative or friend who has passed away. Address and location of Peter J. Jannetta which have been published. Click on the address to view a map. Peter J. Jannetta was born in United States. Peter J. Jannetta died in United States.